As I say every year, one of my favorite holidays is here. Thanksgiving is probably the only time of year that everyone in our country gives themselves permission to slow down and appreciate what we have. Many of us are blessed in so many ways—ways that we often don’t realize or appreciate. I hope you truly give yourself the permission to pause and reflect on the things that bring you joy in your life. As always, one of the things that I am grateful for is our supporters like you. You make it possible for FAR to do the work that we do, and to make a lasting impact on the people and nation of Armenia. For that, I sincerely thank you. 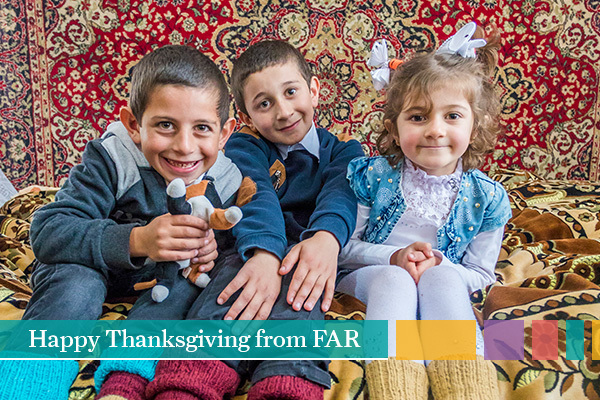 This Thanksgiving, please also take a moment to think about those in Armenia who struggle and who need assistance. Consider giving this holiday to support them.